Thàinig na ceud Ghàidheil, anns an t-soitheach “Hector,” gu ruige cladaichean na h-Albainn Nuaidhe ann an 1773. Dh’ fhàg iad cost an iar-thuath is mu chuairt Inbhir Nis, a’ seòladh bho Loch Bhraoin an Alba, is thàinig iad gu tìr `s an àite `s a bheil Baile Phictou an diugh. Lean Gàidheil eile orra às àiteachan air a’ Ghàidhealtachd mar a tha Taobh Siar Rois, Cataibh, agus an t-Eilean Sgitheanach. `S ann dha `n Eaglais Chlèirich a bhuineadh a’ chuid a bu mhotha a thuinich anns a’ cheàrnaidh seo. Tha buaidh na h-Eaglaise Caitligich na `s treasa ann an sgìre Antaiginis, le Oilthigh Naoimh Fhransaidh: a’ cheud oilthigh ann an Ameriga a’ Chinn a Tuath a thairg Gàidhlig mar chuspair cùrsa ann. `S e Gàidheil às ceàrnan dhe `n Ghàidhealtachd mar a tha Srath Ghlais, Eilean Eige, Lochaber, Mòrar, agus Mùideart a chruthaich coimhearsnachdan ùra an Antaiginis. Tha Pictou is Antaiginis ainmeil mar àiteachan Gàidhealach aig a robh daoine leithid Bàrd na Ceapaich, Bàrd MacGill’Eathain, agus am Pìobaire MacGilleBhràth. The first round of Highland immigrants coming to Nova Scotia landed at Brown’s Point, Pictou County on September 15, 1773. Originating from the north-west coast of Scotland, they arrived on the Ship Hector. Others followed from areas such as Wester Ross, Sutherland, and Skye. Pictou County has a longstanding tradition of Presbyterianism. Antigonish County is largely Catholic and home of St. Francis Xavier University – the first university in North America to offer Scottish Gaelic as an elective. Immigrants settling in Antigonish hailed from such places as Strathglass, the Isle of Eigg, Lochaber, Morar and Moidart. 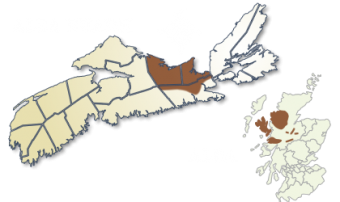 Both Pictou and Antigonish counties are well represented in terms of Gaelic culture as exemplified by bards Alexander MacDonald (the Keppoch Bard), the Bard MacLean, and Piper MacGillivray. La première vague d’immigrants néo-écossais en provenance des Highlands est arrivée à Browns Point, dans le comté de Pictou, le 15 septembre 1773. Ces personnes originaires de la côte nord-ouest de l’Écosse sont arrivées à bord du navire Hector. D’autres ont suivi, en provenance de régions comme Wester Ross, Sutherland et Skye. Le comté de Pictou a une tradition de longue date de presbytérianisme. Le comté d’Antigonish est en majorité catholique et on y trouve l’Université Saint Francis Xavier, qui est la seule université nord-américaine à offrir des cours de gaélique écossais. Les immigrants qui se sont établis à Antigonish provenaient de lieux comme Strathglass, l’île d’Eigg, le Lochaber, Morar et Moidart. Les comtés de Pictou et d’Antigonish sont tous deux bien représentés dans la culture gaélique, avec des bardes comme Alexander MacDonald (le « Barde de Keppoch »), le barde MacLean et le cornemuseur MacGillivray.